Public Matters | Greetings from East L.A. 2018 Open Houses! 10 Apr Greetings from East L.A. 2018 Open Houses! 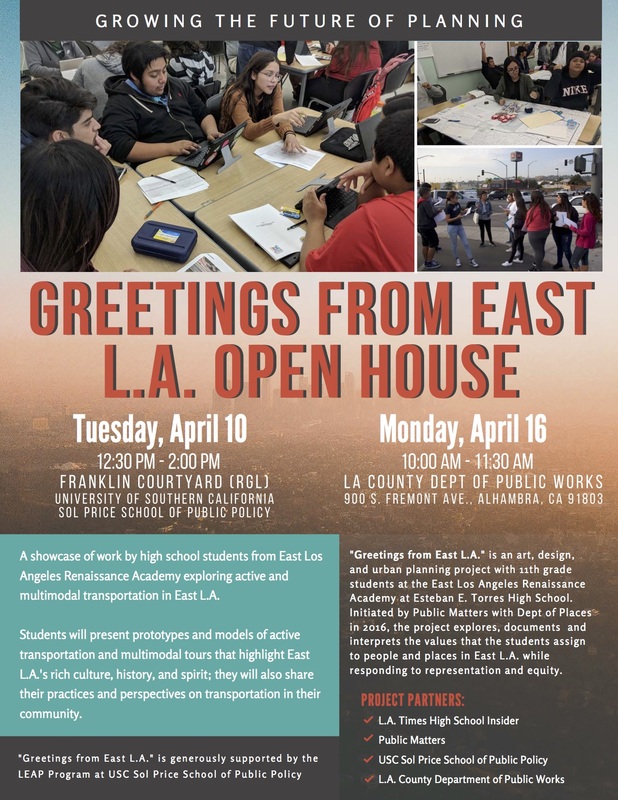 We are hosting not one, but two, open houses to highlight the work of “Greetings from East L.A. ” Please join us! The open houses showcase work by high school students from East Los Angeles Renaissance Academy exploring active and multimodal transportation in East L.A.
Students will present prototypes and models tours that highlight East L.A.’s rich culture, history, and spirit; they will also share their practices and perspectives on transportation in their community. “Greetings from East L.A.” is an art, design, and urban planning project with 11th-grade students at the East Los Angeles Renaissance Academy at Esteban E. Torres High School. Initiated by Public Matters with Dept of Places in 2016, the project explores, documents and interprets the value that the students assign to people and places in East L.A. while responding to representation and equity.